India is said to be the birthplace of Buddhism. With thousands of Buddhist devotees making their way to pay respect to their one true spiritual leader, this 10 days and 9 nights of Ajanta Ellora and Sanchi Buddhist tour package will take you on an epic journey across the most significant spots of Buddhist relevance. Be a part of this soul enriching and mind cleansing tour of important Buddhist sites which will stay with you forever. People from far and wide to commence this journey with an aim of paying an ode to Lord Buddha as well as simultaneously calming your mind, heart and soul. Each of the places covered will definitely bring you some peace of mind and lead you to a better life. Once our tour representative greets you in Delhi, you will then be further assisted to board your flight for Aurangabad and kick start your spiritual journey. Upon arriving in Aurangabad you will be checked into your hotel for a comfortable stay. The remainder of the day is for your leisurely activities before you have your dinner and hit the bed. After breakfast your day out will commence, which will start off with a visit to Ellora and Ajanta caves. 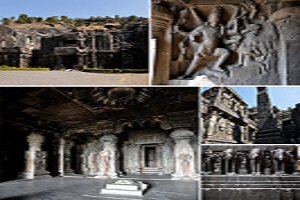 With the availability of 34 caves in Ellora dating between 6th and 11th century AD and 29 caves in Ajanta which dates to 2nd and 6th century BC, these two collections of cave sites are an extremely unique and important UNESCO world heritage site. Where Ajanta caves are all Buddhists on the other hand Ellora caves are a breathtaking mixture of Hindu, Jain and Buddhists. With twice the size of the pantheon in Athens and 1.5 times high, the carvings on these two caves were done entirely by hand, using only a hammer and a chisel. A must visit site for every traveler. These intricate and highly detailed carvings on the walls depict the fact that Buddhism has prevailed in the years of 200BC to 650AD. The excursion trip to these caves complex will take up a huge chunk of your day before you head out for your next destination of Bhopal. After taking in the incomprehensible magnificence, you will then be taken to the railway station for an overnight train journey to Bhopal. Once you have arrived at Bhopal you will be duly checked into your hotel to freshen up and relax for a while before having your breakfast meal and heading out for the day. Your excursion’s first stop will be the famous Sanchi stupa. Built in the 3rd century BCE and commissioned by emperor Ashok, this stupa is not only the best conserved stupas in India, but it is also extremely significant for Buddhists. It reflects the true Buddhist architecture and art, it enshrines several of Lord Buddha’s relics. This stupa is also a UNESCO world heritage site and is among the one of the most visited stupas in the world. After this, you will be taken back to your hotel in Bhopal to collect your luggage and head towards the railway station from where you will board the train headed towards Agra. The train journey will take close to 8 hours. 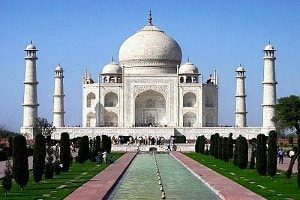 Once you arrive in Agra, our tour representative will get you checked in to your allotted hotel where you will be served your dinner and spend the remainder of the night. Early in the morning post breakfast, you will be taken for a visit to the spectacular 7th wonder of the world, Taj Mahal. This is an architectural marvel and was built by Shah Jahan in the form of a mausoleum dedicated to his favorite wife Mumtaz who died during childbirth. The beauty and ivory white grandness is incomparable and to present day no structure like this has been constructed. The entire Taj complex is lined with formal gardens, fountains and giant gateways. Next you will be taken to the Agra fort which sits across the River Yamuna and can also be seen from Taj mahal. This fort was the main residential complex for all the mughal emperors till 1638. This walled city is made from red sandstone containing all the characteristics that were considered grand and royal. Next you will be taken to Akbar’s tomb, which is also an important architectural piece. Panning on a whopping area of 119 acres, this tomb is located on the suburbs of Agra. The whole tomb is adorned in fine and intricate works of art, from geometric to floral patterns, the entire tomb is classy as well as extremely magnificent to look at. After this excursion you will be guided back to your hotel where you can stretch your legs, relax and spend some time in exploring the nearby local areas. You will finally end the day with dinner and a night stay. After having a delicious meal in the morning you will be escorted to the airport from where you will be boarding the flight to Patna. Upon your arrival in Patna you will be transferred comfortably to your hotel where your day will be spent relaxing away and doing leisurely activities. Finally after dinner you will be spending the night here. After having your breakfast you will be headed towards Bodhgaya enroute the ancient capital of Magadha Empire, Rajgir. Rajgir is notable for being of immense relevance to Buddhists and Buddhism. Rajgir is Lord Buddha’s one of the most favorite places from where he gave his largest number of teachings and discourses to his disciples. He is also known to spend a lot of his time on the vulture hills, meditating and offering penance. Saptaparni cave is the spot where the very first Buddhist Council took place making this site of immense importance to the Buddhists. After that you will be taken to Nalanada, the oldest university and learning centre of the world. Established in the 5th century BC, this university was a major Buddhist Monastery which also involved teaching formal vedic techniques. Learners from Central Asia, Korea, Japan and Thailand flocked this centre with an aim of achieving some of the best teachings in the world concerning Buddhism. Currently an UNESCO world heritage site, only the ruins remain which to this day is visited by visitors from far and wide. Finally you will be made to visit the archeological museum of Nalanda, which houses all these rare antique that were excavated from Nalanda. These antiquities date back to, 5th century to 12th century AD. You will witness terracotta figurines, stucco statues, sculptures, seals among a number of other important rarities. You will finally be made to head for Bodhgaya, which is a 3 hours and 30 mines journey from Nalanda. Once you arrive at Bodhgaya, you will be checked into your hotel for dinner and a night stay. Bodhgaya is one of the most sacred and holy sites in Buddhist pilgrimage. Early in the morning after you have your meal, you will be taken to the most important centre of Mahabodhi temple, which also houses the Bodhi tree, meditating beneath which Lord Buddha had gained his enlightenment. Buddhist pilgrims make sure that they visit this spot at least once in their lifetime. The Mahabodhi temple was built by emperor Ashok during the 3rd century BC. The bodhi tree and temple interiors are filled with monks who meditate there for some peace of mind. The temple has gone through a tumultuous history of construction, destruction and re construction, making it one of the most significant ancient Buddhist temples in the world. Finally you will be taken to Varanasi, which is located at a distance of 6 hours’ drive from Bodhgaya. The moment you arrive there, our tour representative will check you into your hotel for a night stay and dinner. Early in the morning you will be made to experience the splendor of the holy River Ganga, by taking a boat ride while witnessing the magnificent sunrise. You will then be served breakfast before starting your excursion to Sarnath, which is one of the most significant Buddhist pilgrimage centre. This is the exact place where Lord Buddha gave his very first sermon after achieving enlightenment, to his 5 disciples. 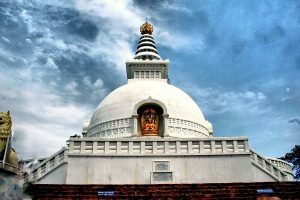 Sarnath is home to the famous Chaukhandi and Dhamek stupa, which contain numerous relics related to Lord Buddha. A visit here will definitely rejuvenate your senses. 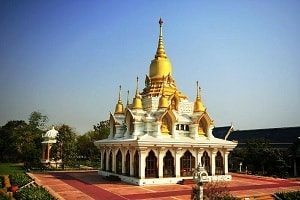 After paying your respects to the holy site, in the afternoon you will then be made to head towards Kushinagar, the exact location where Lord Buddha breathed his last and was then cremated here. This is also the same place where he passed on to a state of Parinirvana, making this centre one of the most important Buddhist pilgrimage location. The temple here showcases a 6.1 metre long statue of Lord Buddha reclining on his right side, in a peaceful sleeping position. Your day will conclude on a peaceful note by getting checked into your hotel here and staying overnight at this place. Post breakfast in the morning you will be escorted for an excursion of the holy site. Your time here will start off with a visit to the famous Ramabhar stupa, where Lord Buddha’s cremation ceremony took place. This holy spot is visited by thousands of Buddhist pilgrims on a daily basis who offers their prayers and offerings in front of the stupa. 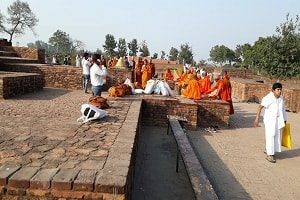 After spending some quality time here you will be made to head towards Sravasti to Lumbini. Being the birthplace of Lord Buddha, Lumbini is one of the holiest and the most significant spot in the world for Buddhist pilgrims and devotees. The shrine here is ancient and the image which represents Lord Buddha is conserved perfectly for visitors to offer their prayers. Finally you will be checked into your hotel where you will stay the night after having a wholesome dinner. Apart from breakfast, your early morning time is reserved for a small visit to the capital city of ancient Kosala kingdom, Sahet-Mahet. This place is an active centre of Buddhism since this was the site from where ancient inscriptions and idols of Lord Buddha were recovered. Buddhist pilgrims from across the globe flock here with an aim of completing their spiritual journey. Finally you will be transferred to the airport here on a flight headed to Delhi from where you can head on to your desired destination.